SEO is an ever-shifting digital landscape of algorithm updates and search engine tactics. Mastering the art of SEO requires staying ahead of the curve, on the cutting edge of current trends with a finger on the pulse of the tech, content marketing, and search advertising industries. This can be hard when it seems like Google or Bing updates their policies and algorithms monthly, but a constantly evolving digital frontier is what makes our industry so irresistibly fun. Search Engine Optimization is an overwhelmingly in-demand expertise that can launch small businesses towards transformative success and allow new nonprofits to spread a message of social good to a vast audience of online supporters. In short, SEO is still one of the most critical factors of digital growth and an organization’s ability to financially thrive in today’s cloud-based global marketplace. If you want to be heard, you need great search engine optimization, and what defines great SEO changes all the time. Don’t fret, though, because we have you covered on the cutting edge. Here’s the latest and greatest from the wide wild world of search engine optimization. 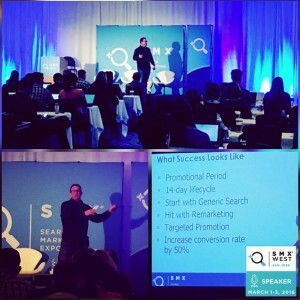 Emergent Digital founder Dave Roth also spoke at Search Marketing Expo 2016 in San Jose! SMX West, the premier search marketing conference on the west coast, took place last week as SEO industry influencers shared their knowledge in a fun and relaxed atmosphere. Breakthroughs in search advertising, engaging SEM discussion panels, and the epic Google Dance party at Googleplex HQ defined the week in San Jose for those lucky enough to attend. One such attendee was Google’s very own Juan Felipe Rincon, who revealed that the search giant’s team receives over 35,000 monthly user-submitted spam requests, taking action on roughly 65% of them. Holy black hat, Batman! That’s a ton of requests to deal with, even for a company trendsetter like Google, and the fact that they do anything with more than 65% of them is simply mind-boggling. The SEO discussion at the “Google Manual Actions” panel also explained that users who consistently submit high-quality spam reports are more likely to receive an attentive response on new submissions. The ISIS-backed hacker group known as the “Cyber Caliphate Army” (CCA) announced plans to hack Google services last week, making good on their promise shortly afterward. With all their genius expertise and adept skill, the CCA struck with force… mistakenly shutting down the website of an Indian SEO firm that had the brilliant idea of including Google in their company name. Cyber security is a massive issue facing the tech-based society we live in, one that will not go away anytime soon. However, making threats against one of the largest companies in the world and missing the target for a tiny search engine optimization company on the other side of the world is… well, it’s hilarious. If the writing wasn’t on the wall for you already, here’s another clue pointing to social media overtaking traditional search engine authority in the coming decade. Facebook recently overtook Google as the highest referral traffic-generating site via image and video content worldwide, and they have just invested a massive amount of money in their internal search system. With over 1 billion active daily users, Facebook has made stellar strides in functionality these past few months, and it looks like their next step is dramatically improving their search function. While SEO is still carried out primarily through quality content marketing and proper site architecture indexed by Google or Bing, social media networks are going to try and give them a run for their money. If or when that time comes, the business of SEO will be changed forever.